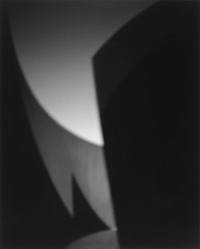 Artist Hiroshi Sugimoto did a series of black and white photographs of Richard Serra’s Joe, a sculpture which sits in an outside courtyard at the Pulitzer Foundation for the Arts in St. Louis. Sugimoto’s work is interesting for a variety of reasons not least because of Serra’s own surprise: “This is not about me”. 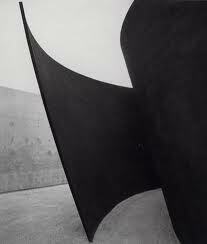 The several ton piece was Serra’s first torqued spiral and he was shocked that the Japanese photographer had not undertaken a documentary style project. Instead, Sugimoto used the opportunity to create a work of his own and with it a more effective conveyance of the sense of Serra’s ideals than a more literal interpretation ever could. 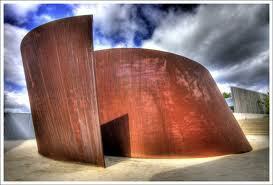 The images abstract and cerebrate the unexpectedly complex physical experience of the huge hot rolled steel spiral. The two dimensional representations are thus elemental forms manifested and manipulated by Serra and returned to the Platonic realm by Sugimoto. Furthermore, fascinatingly, Sugimoto doesn’t see Joe as relating to its namesake, Joseph Pulitzer. “I see it as related to my seascape series as a metaphor of human memory.” He tells us that a seascape is likely the least changed vista since the rise of consciousness. A gaze upon one thus shares an ethereal resonance with those of our earliest ancestors as well as all those between. An early product of this awareness was remembrance of the dead. The first proto-human efforts beyond feeding, fighting, fleeing, or f______ (making babies) were the creation of graves, tombs, and then cenotaphs. Sugimoto calls Joe a “metaphor and system of remembrance”. Seems to me that the relationship between Joe and Photographs of Joe is a metaphor for the evolution of consciousness. *Quotes from the exhibition brochure “Hiroshi Sugimoto – Photographs of Joe; edited by Matthias Waschek; published by the Pulitzer Foundation for the Arts; 2006. This entry was posted on August 26, 2011 at 9:16 pm and is filed under architecture, Art, consciousness/psychology. You can follow any responses to this entry through the RSS 2.0 feed. You can leave a response, or trackback from your own site.